Traditional poke at Pa'Ina Cafe in Oahu, which will be in the Bay this weekend at the I Love Poke Festival. I'm a no-frills eater, and so the simplicity of a dish like poke has always appealed. A light dressing of sesame oil, some sea salt — and of course smartly sourced, fresh, and sustainable tuna or other fish. That's it. Perfect. But now that poke is an emerging food trend, there are all sorts of spots popping up that serve hybridizations (and bastardizations) of traditional poke. I'm not hating. A sturgeon poke with yuzu ponzu sauce and topped with avocado and served over sushi rice is pretty damn tasty. But is it really poke? Nino Camilo might argue that it isn't. Which is why the former islander, now mainlander started his "I Love Poke Festival" series in 2010. And he's finally made his way to the Bay Area this weekend, with an inaugural "I Love Poke Festival" this Sunday at Pacific Catch in San Francisco. The event will be an intimate gathering of fewer than 200 and where guests can sample a wealth of traditional poke, including from Pa'Ina Cafe, whose team is flying out from Oahu for the occasion. Hutch from Oakland will also be there, in addition to the excellent Fish Face Poke Bar in Sacramento. Learn more at Onoyum.com, and purchase tickets here. EBX: Where is poke on the "trend scale" in the Bay Area and beyond? Is it in frozen yogurt or cupcakes territory, or pork belly, or? Basically, what I’m asking is: Is poke the next big thing? Nino Camilo: I like to break the poke game down like this: There's Hawaii poke which is just in a league of it's own. We are really fortunate to have Pa'ina Cafe (Oahu) fly out for the event. They will be judging the poke contest as well as serving one of their signature poke recipes. Then, there are the OG's of the mainland poke game, like Pacific Catch, who have been serving poke for 13 years, as well as Pono Hawaiian Grill (Santa Cruz) who are actually from Maui. These guys starting serving poke back in the day simply because it's a part of the passion and the culture of any Hawaiian or seafood style eatery. And then there's the third wave of poke ("third wave", let's steal that term from our coffee brothers and sisters). These poke places have all opened up within the last year or two. In fact, most of the spots I visited last month in San Francisco were only four days to four weeks old! I am going to be honest and say that at least 50 percent of these places are not actually serving poke, but they are serving varietals of raw fish bowls with mixed veggies and sauces. One day, we will give these bowls a name. But for now, let's just say they are not poke. And I hope people really start paying attention to what they are serving and what they are claiming. Big ups to the guys that are actually doing it right. Let's be responsible with our sourcing and respectful to the culture of which poke came from. Poke is the next big thing, but only some are doing it right. Everybody loves a simple poke because that's what poke is ... simple. "It's like, how can something with such little ingredients taste so good?" But poke has to be fresh. Just some shoyu, sesame oil, onions, chili flake and Hawaiian salt. But, I also love new styles of poke where chefs get creative. The key to this is to make sure that whatever ingredients you use, blend [them] together well. You can't just throw things in there to be different. How long have you been putting on poke festivals? I started our flagship event, I Love Poke San Diego, back in 2010. I started a food blog back then that focused on Hawaiian food in California. The thing missing from every menu was poke, so I started the event to help satisfy the cravings of my family, friends, and followers living on the mainland. I'm not crazy enough to open up a restaurant, so I chose an annual event instead. We have also done the event in Huntington Beach and Seattle, and we are so stoked to make our debut in the Bay Area this year. This event is not about consuming mad amounts of good poke, that is just the added benefit of what we are trying to do. By doing this event, we are sharing, celebrating, educating and preserving a culture that we all love. 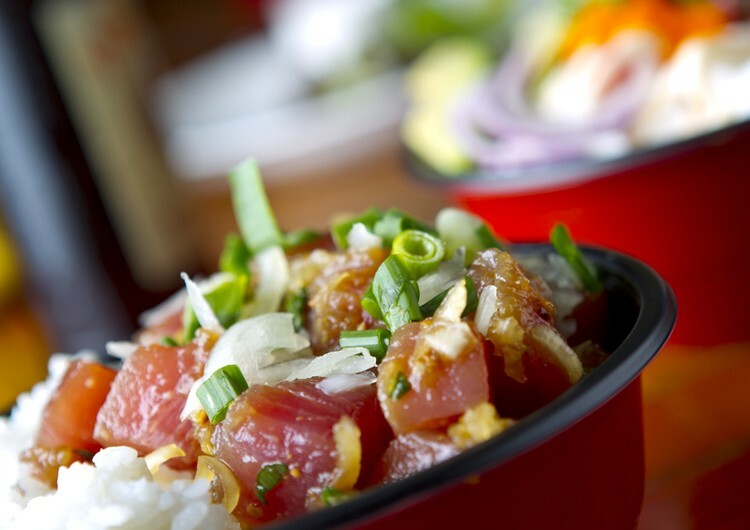 I Love Poke Festival is Sunday, July 24, at Pacific Catch (1200 Ninth Avenue in S.F. ); 4-7PM, $85 in advance, $100 at the door.